The Young and the Restless (Y&R) spoilers for Wednesday, September 20, tease that it’ll be a rough day for Cane (Daniel Goddard). After filling Hilary (Mishael Morgan) in on his marriage counseling plans, he’ll head off feeling somewhat hopeful. Unfortunately, Lily’s (Christel Khalil) encounter with Juliet (Laur Allen) will leave her more uncertain than ever. After enduring an awkward conversation, Lily will take a breather outside the coffeehouse. Their interaction will really take a lot out of her. Once it’s time for marriage counseling, Lily will be in no mood to forgive. Cane will admit that he drank too much and cheated, but he’ll insist that he’s incredibly sorry. Lily will contend that this goes beyond a one-night stand. She’ll fill the counselor in on the rest of Cane’s lies. Juliet’s pregnancy has been particularly difficult to get past. Lily can’t carry her own baby, so it’s hard to watch Cane have one with someone else. Sadly, Lily won’t know if she’s even willing to try. When the marriage counselor asks if she wants to save this marriage, Lily won’t say anything. She’ll finally break the silence by suggesting that she only came to counseling for the kids. Cane will be upset over the revelation, but Lily will ultimately leave the room. She’ll decide she just can’t deal with all this. Later, Michael will wonder where Cane and Lily stand. She’ll confess that she’s not sure there’s a future for them. Michael will also run into Kevin (Greg Rikaart) in Wednesday’s Y&R episode. He’ll get updates on Kevin’s new life with Bella (Gia Poeme) and they happiness they’ve found. 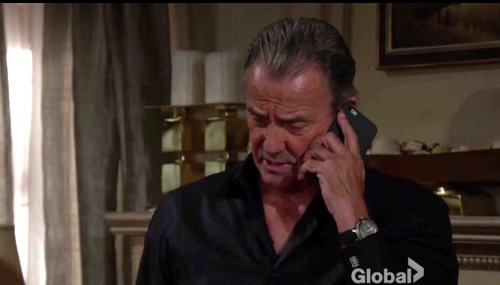 Kevin will eventually get to the real reason for his visit, which happens to be a meeting with Victor (Eric Braeden). When he shows up at the ranch, Victor will spill all the details of his feud with Nick (Joshua Morrow). He’ll add that his own son turned Faith (Alyvia Alyn Lind) against him. Kevin will ask what Victor intends to do about it. He’ll assume there must be some sinister trick up Victor’s sleeve. The Young and the Restless spoilers state that Victor will offer some cryptic comments. He’ll suggest that Nick needs to put his money where his mouth is. It sounds like Nick may regret taking steps toward independence! At Chelsea’s (Melissa Claire Egan) penthouse, she’ll listen to Jordan’s (Darnell Kirkwood) complaints about Devon (Bryton James). Once Jordan admits that he’d like a chance with Lily, Chelsea will offer a warning. She’ll think Cane and Lily are going to get back together sooner or later. Afterward, Hilary will share Cane and Lily’s counseling news with Jordan. He’ll insist that they should work through their problems if they can. The Young and the Restless spoilers say we’ll see some sexual tension between Jordan and Hilary. They’ll give each other some sensual stares during a workout routine at the gym. It looks like a great episode is on the way. We’ll keep you posted as other Y&R details emerge. Stay tuned to the CBS soap and don’t forget to check CDL often for the latest Young and the Restless spoilers, updates and news.